Here’s the next installment in a review series based on my habit of revisiting a whole series before reading a new title in it. 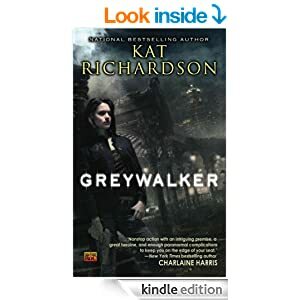 I just finished Revenant, the latest in the Greywalker series, so I’m doing a Greywalker review that starts with the first book and then touches on the rest of the series named after it. As a series, Greywalker gets a solid 3.5 stars, but its initial offering didn’t thrill me. 2.5 to 3 is the best I would give it. Don’t get me wrong — it didn’t disappoint. It was a solid, filling, basic meal of urban fantasy. The best analogy I can make is that it was a lot like a cheap lunch buffet. The first book offered lots of the same old essentials in a popular but predictable arrangement. Each savory tidbit of originality was buried between lots of the expected filler dishes. Some of the foods were accented by sharp saucy details, but others were blandly unmemorable. A spicy first-person POV gave the dialogue a zesty touch, and the action is non-stop, but nothing could save it from tasting a little stale. I like a good basic buffet. I enjoy sampling a little of this and that, comparing each offering to other versions of the same dishes, and stuffing myself on a ton of starchy goodness. I had myself a big tasty plateful of this book– vampires, undead, new version of “how the world works,” obligatory romantic tension, predictable conflict between the mundane and the magical etc. I liked it enough to go back for seconds, thirds and all the way up to ninths. Unlike a basic lunch buffet, this series does improve with acquaintance. The Grey is more than it seems to the protagonist at first, and the more complex it becomes, the more original and interesting the plots get. The home setting is Seattle, which is always a draw for me, and in every book the setting is an integral part of the story. The unique character of each city the main character ever visits is nicely evoked without slipping into travelogue. As happens at busy buffets, the plates aren’t quite clean. Meaning, in this case, that the prose is good but not gleaming. The words have the unmistakable polish of multiple edits, and no glaring punctuation or grammatical errors jarred me out of the reading flow but the writing was neither lyrical nor starkly minimalist. It hangs somewhere uncomfortably between. Descriptions were sometimes awkward and overblown, and the plotting often felt strained. A thing happens. Another thing happens. People talk. Secrets are revealed, leading to a new Thing happening, and the plot hitches forward. Once again, this issue improves as the series goes on, although I would say book 7 was the peak for me. Book 9, Revenant, will be the last one I read. It ends on a good wrap-up note, and while author’s world has many more stories in it worth telling, I think these characters have reached the end of their time on the buffet and should be set aside in favor of fresh dishes. TL;DR edition: Solid urban fantasy of the now-familiar “protagonist discovers the world behind the paranormal curtain” type. Nothing to rave about, but enjoyably readable. Mashed potatoes and gravy fare.